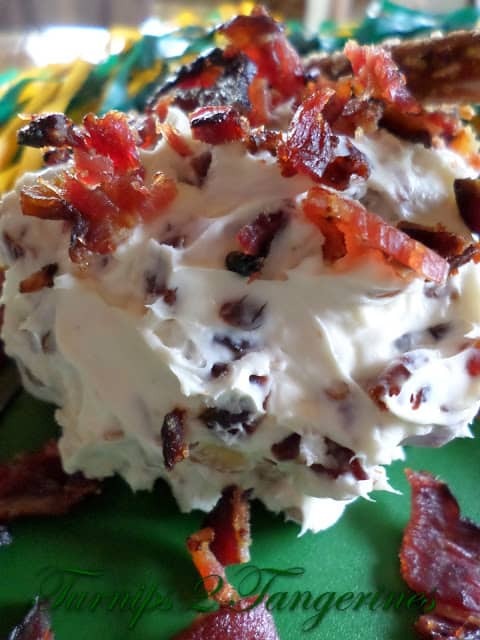 This dip has all of my favorites; cream cheese, bacon, dried cherries and toasted pecans. Serve this yummy dip with pretzels, pumpernickel pretzels crackers of your choice, celery and/or carrot sticks. The combination of flavors in this dip is delicious. 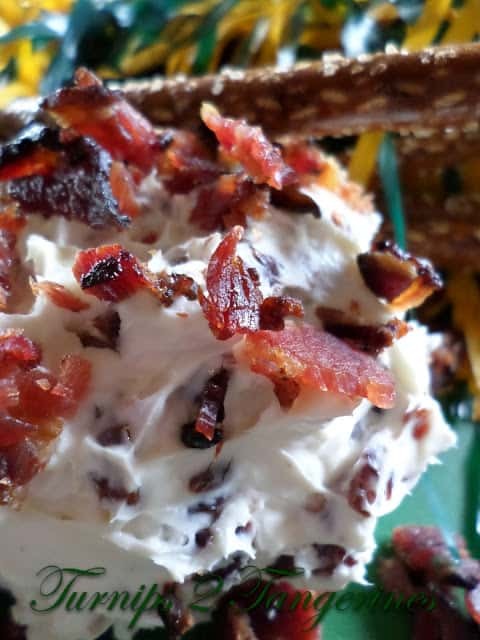 You will definitely score a touchdown with this dip. In a small saucepan combine butter, vinegar and sugar. Boil for 2 minutes. Remove from heat and cool. In a medium bowl, beat cream cheese and cooled vinegar mixture. Beat until creamy. Add minced onion and minced green pepper. Beat until well combined. Refrigerate 2 hours. Fold in minced dried cherries, chopped toasted pecans and chopped crispy bacon. Shape mixture into a ball. 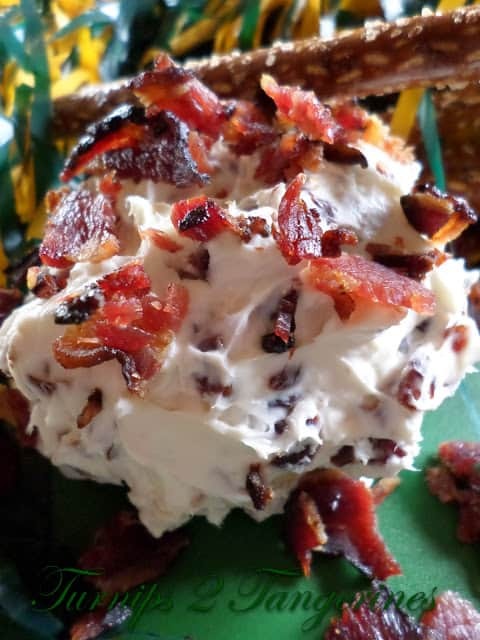 Place on serving plate, garnish with 1 tablespoon reserved chopped bacon. Over the years, I've had my share of cheeseballs. This combination of ingredients is new to me. Sweet, tart, nutty, savory…you've covered it all, Lynn! I've been enjoying your game day recipes. Hi, Lynn. Wanted to let you know that your cheese ball was one of the top-viewed links from last week's party! It will be featured tonight when this week's party goes live. Thanks again for linking! Such an interesting combination of flavors I can see you it is one of your favor dips. Thanks for sharing it with us on foodie friday. This feels so Christmas-y to me, I love it! What a great recipe – that's perfect for the holidays! Thanks so much for linking up to Freedom Fridays this week, Lynn 🙂 I hope you have a wonderful weekend and I hope you'll join us again next week!